Support St Clare in a fun and innovative way! St Clare Hospice is on the lookout for online-shopping-savvy individuals who can lend their skills to the our eBay team. Last year, St Clare’s eBay shop (stores.ebay.co.uk/St-Clare-Hospice) generated approximately £25,000 in vital funding for the charity, with this sum increasing each year. In 2018-19, the eBay shop generated enough to fund more than five-hundred 90-minute home visits to local people by a St Clare Hospice at Home nursing assistant. With the Hospice’s plans to expand our care and reach more local people than ever over the next few years, it is essential that our Retail also continues developing its current work to raise the funds needed to pay for future patient care. However, the growing success of St Clare’s online retail outlet relies on the generosity of local people who volunteer their time and skills as St Clare eBay Assistants. If you consider yourself an expert in all things eBay, or have a passion for online shopping and retail marketing, why not consider volunteering a few hours a week at your local Hospice? 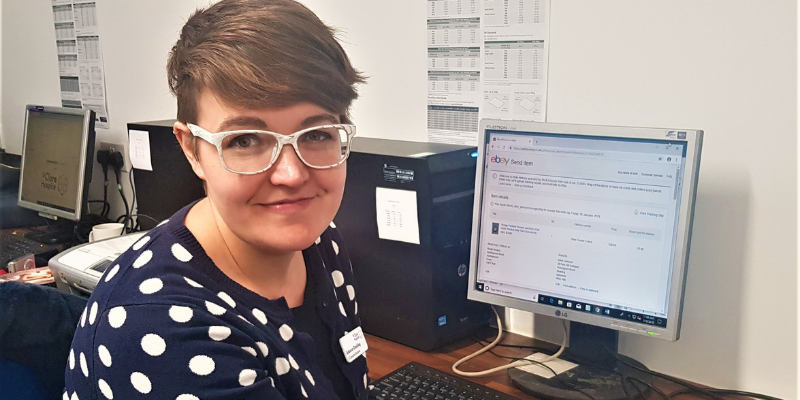 The role of St Clare’s eBay Assistants entails listing donations on the online shop, researching the value of items, photographing stock and writing compelling descriptions of the products to encourage people to view and place bids. Volunteers will also be required respond to any queries and liaise with buyers about payment as required, then pack and post items to customers. This volunteering opportunity is based at St Clare Hospice in Hastingwood. St Clare Hospice welcomes donations of good-quality, pre-loved goods for listing on its online eBay shop. Donors are encouraged to drop off any eBay donations to any of their nine shops, to the Hospice in Hastingwood, or to their brand-new Donation Centre in Bishop’s Stortford. Items must be clearly labelled ‘eBay’. Donating to St Clare’s eBay shop encourages online shoppers to bid on products, maximising the value of stock and generating as much as possible in vital funding for the charity.